Update: Follow along with our 2018 NFL predictions here. Update: I’ve moved the 2016 AMOS model to a more permanent page, along with a revamp of the dashboard. Please keep up with the season HERE. 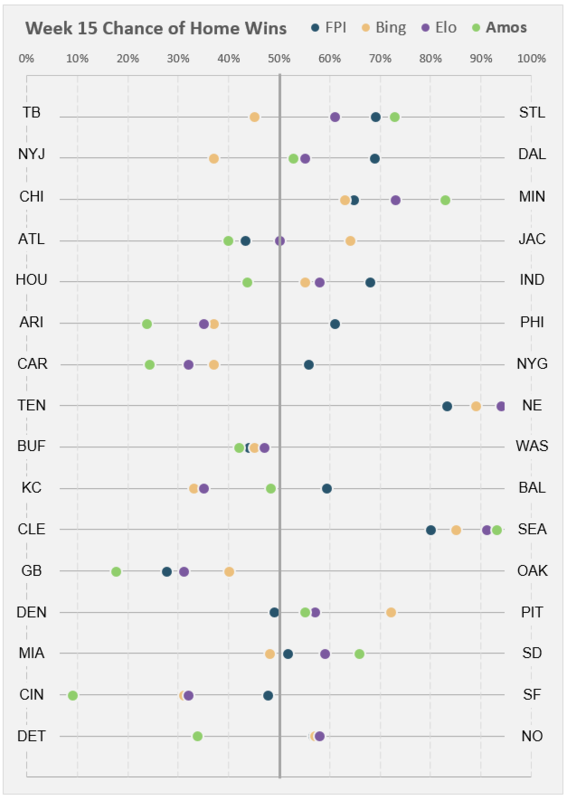 For those just joining, Amos is a statistical model created to predict the outcomes of each NFL game. Amos takes into account 224 different data points to compute three different probabilities for each game. First, Amos calculates the probability of each team winning. The dashboard below then displays the team which has the greatest probability of winning. 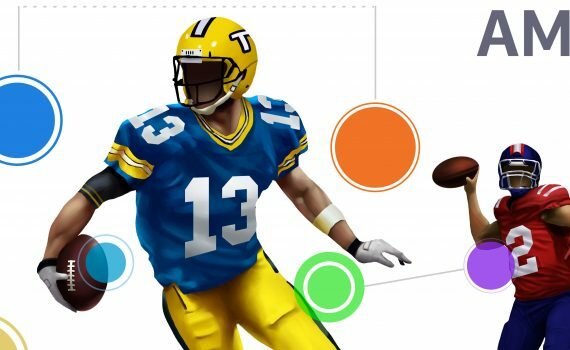 Second, given the spread that has been assigned to a particular game, Amos calculates the probability of that team covering the given spread. Finally, given the Over/Under assigned to a particular game, Amos predicts the probability of both teams’ combined scores to break that threshold. 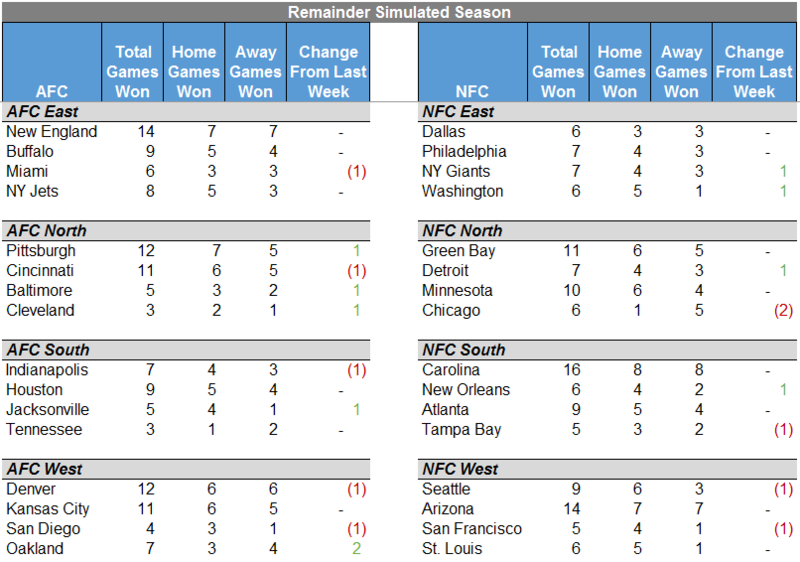 Additionally, Amos then forecasts the remainder of the season and calculates the most probable ending record for each team. 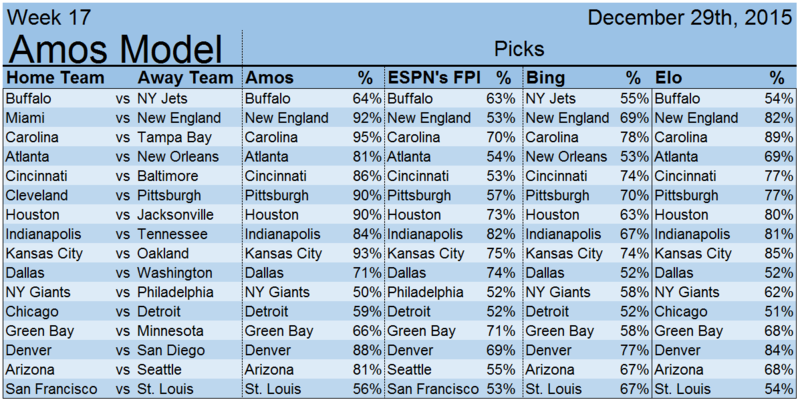 Amos also has peers within the NFL prediction field. 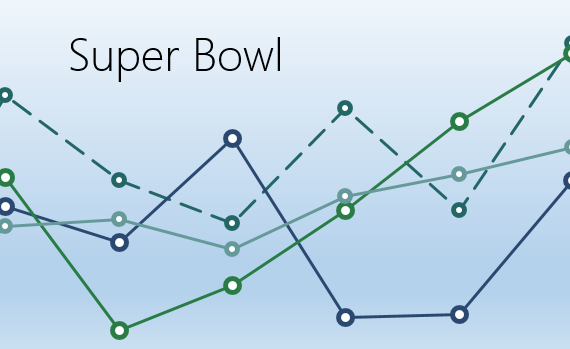 While there are a number of sources for game predictions, I have identified Microsoft’s Bing Predicts (Bing), ESPN’s Football Power Index (FPI) and Nate Silver’s Elo (Elo) as benchmarks for comparison to Amos this year. 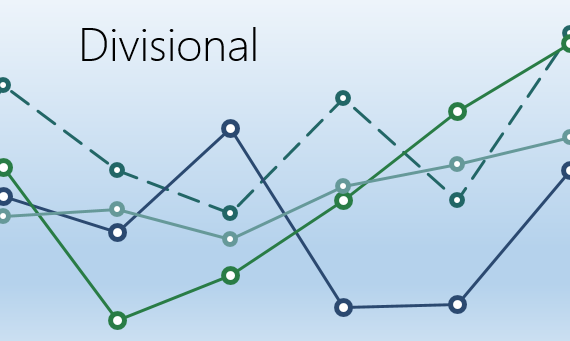 The selection is due to the statistical approach of each of these predictions methods, which provides similar, but not exact, grounds for comparison. As a summarization, the below chart plots all four models’ confidence by game. Dots plotted below 50% represent an away favorite and dots plotted above 50% represent a home favorite. The farther a dot is away from the center, 50%, the more confident a given model is of its predicted favorite. 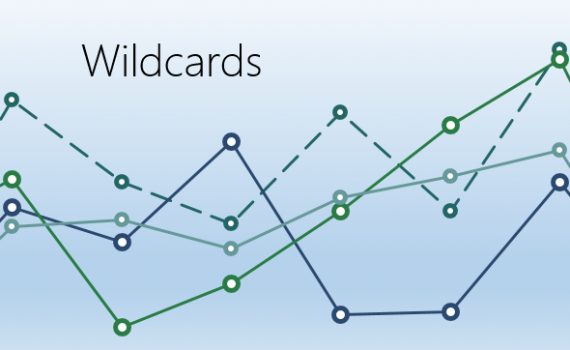 Based on historical data and current team data, Amos also computes probabilities of over/under and spreads being covered. Given the over/under assigned to a matchup, Amos computes the probability that both teams’ combined score will push or cover the over/under. For example, an over/under of 41 has been assigned to a game and Amos has computed a probability of 56%. This means that if the same match up could be played an infinite amount of times, 56% of the time the teams’ combined score will be equal to or greater than 41. To be able to evaluate Amos, if Amos’ assigned probability is above 50% and the teams’ combined score is equal to or greater than the assigned over/under, Amos will be given credit for being ‘correct’. The same is true if Amos’ assigned probability is below 50% and the teams’ combined score is less than or equal to the assigned over/under. Spreads are slightly more complex. For consistency within my modeling techniques, a negative spread represents a home team favorite and a positive spread represents an away team favorite. 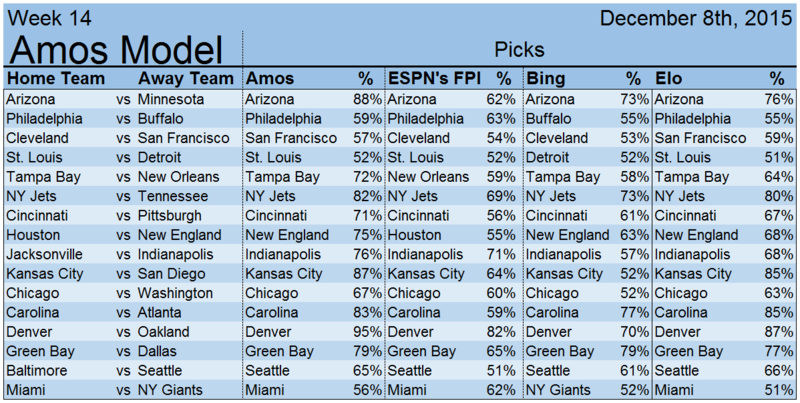 Given this, Amos computes the probability that the favored team will cover the spread assigned to the game. For example, a spread of 3 has been assigned to a game and Amos has computed a probability of 39%. This means that if the match could be played an infinite amount of times, only 39% of the time the away team would win by 3 or more points. 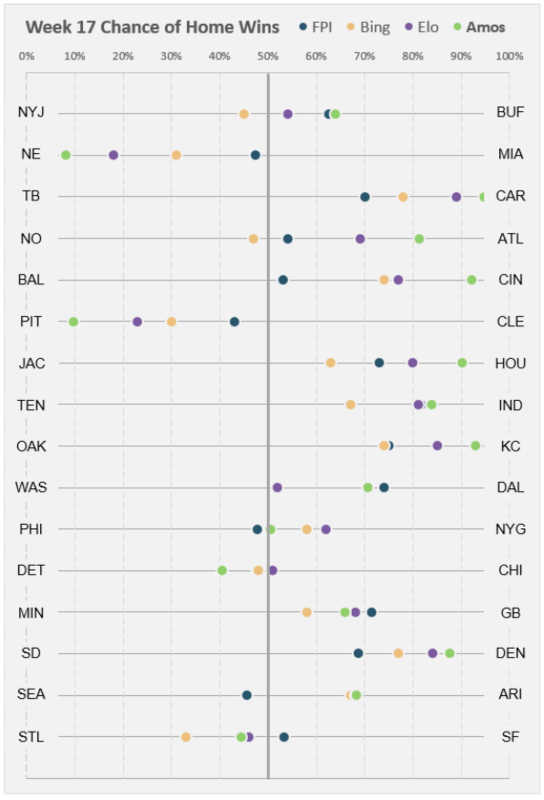 If 3 is swapped out with a -3 in our previous example, then the interpretation would change to only 39% of the time the home team would win by 3 or more points. Amos falls short two games and the rest of the models have a perfect record for the divisional round. For those just joining, Amos is a statistical model created to predict the outcomes of each NFL game. Amos currently predicts games straight-up. 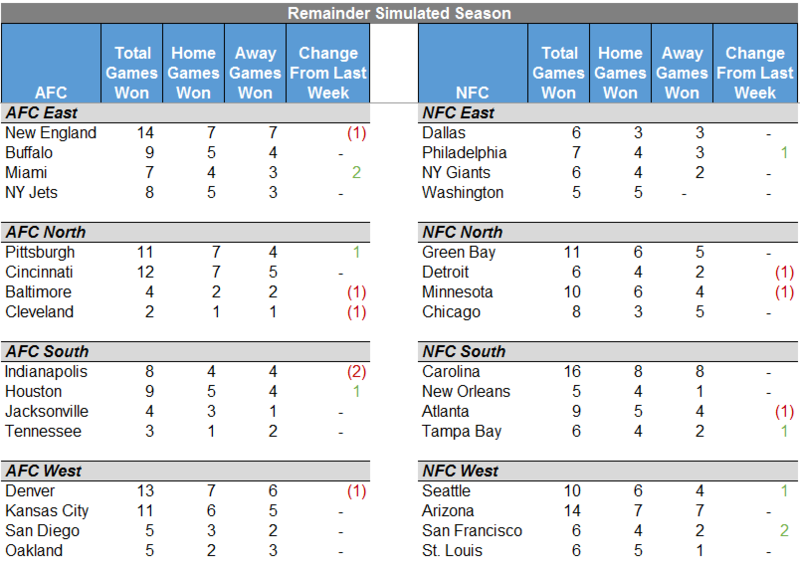 Additionally, Amos then predicts the remainder of the season to compute the ending record of each team. 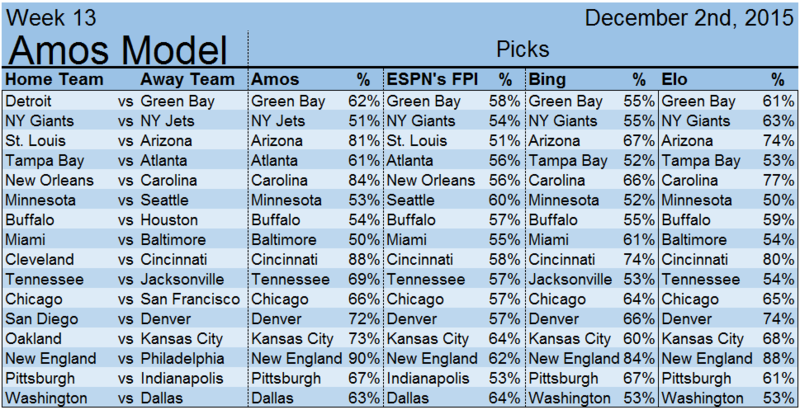 Amos also has peers within the NFL prediction field. While there are a number of sources for game predictions, I have identified Microsoft’s Bing Prediction (Cortana), ESPN’s Football Power Index (FPI) and Nate Silver’s Elo as benchmarks for comparison to Amos. For the Super Bowl, all of the models are in agreement that Carolina has the best chance of winning. While not surprising, it looks like the big game this Sunday will be the New England vs Denver Game, as it has the models split down the middle. For the earlier match-up, Amos and Bing both have New England over Denver, while FPI and Elo both have Denver overtaking New England. Later on that evening, Amos has Arizona over Caroline (66%), while the rest of the models have Carolina taking home the NFC Championship. Amos has also predicted the rest of the playoffs up to the Super Bowl 50. Amos, along with Elo and FPI, capture all but one of the Wildcard games. Bing’s prediction of Washington trumping Green Bay falls through. Amos deviates from the rest of the models, which are in complete agreement. 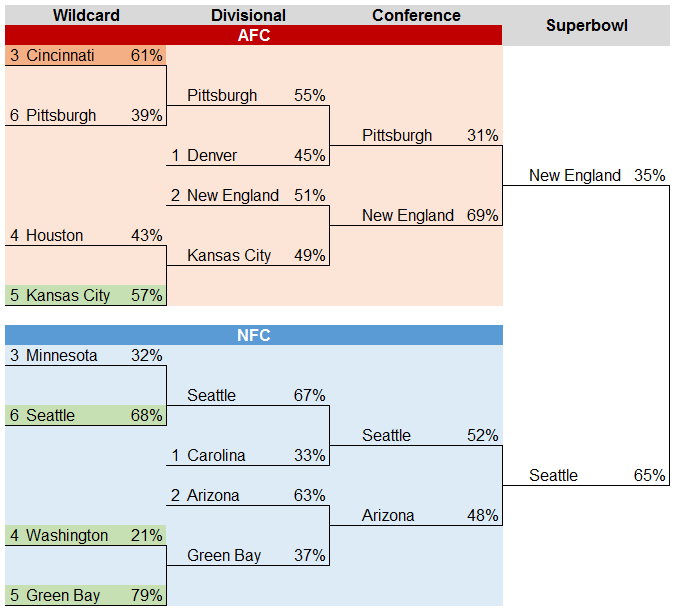 Amos is predicting Pittsburgh to overtake Denver (55%) and Seattle to overtake the almost undefeated Carolina Panthers (67%). The regular season is over. The model standings are in. and Amos and Microsoft’s Bing tied for second. Elo taking a firm lead of seven games over Amos and Bing. FPI came in last, with three games behind Amos and Bing. Amos went 9-7, having misses of New England, Atlanta, Dallas, NY Giants, Green Bay, Arizona and St. Louis. FPI went 12-4, having misses of New England, Dallas, Philadelphia and Green Bay. Bing went 9-7, having misses of the NY Jets, New England, Dallas, NY Giants, Green Bay, Arizona and St. Louis. Elo went 8-8, having misses of New England, Atlanta, Dallas, NY Giants, Chicago, Green Bay, Arizona and St. Louis. 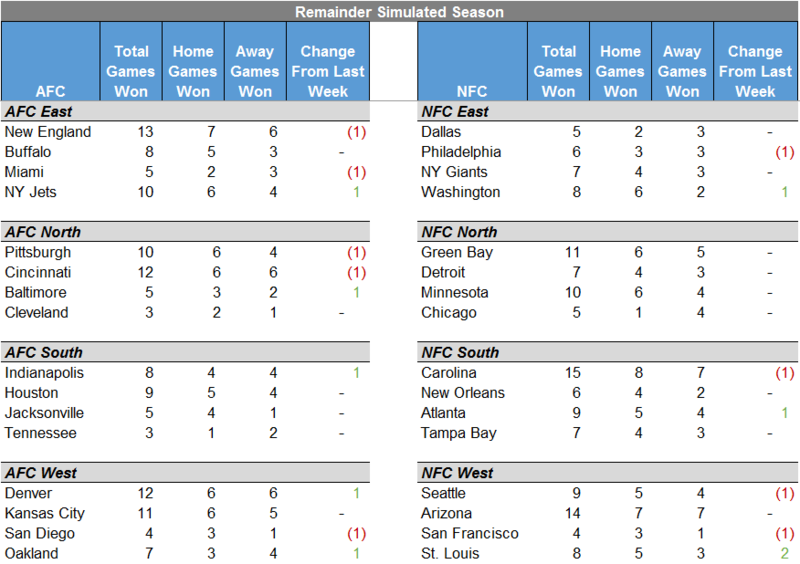 Moving on into the wildcard weekend predictions, a consensus is reached with most of the games throughout the models. As we progress throughout the playoffs, the predictions will continue to be filled out. 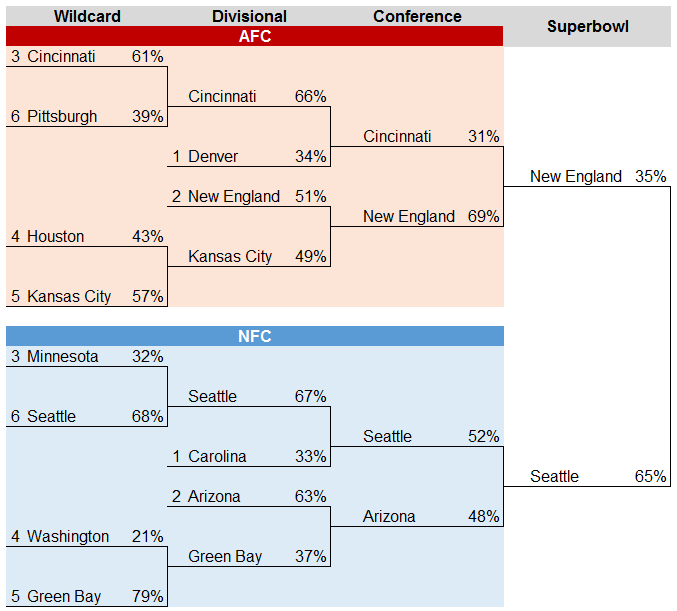 All of the predictions are the same, besides Bing, who is predicting Washington over Green Bay (57%). As we enter into the last week of predictions for the regular season, I’d like to thank all of the readers keeping up with the models and the great season. Amos will continue into the post season through the Super Bowl so be sure to check back. Amos went 7-9, having misses of San Diego, Philadelphia, New England, Miami, Tampa Bay, Carolina, Seattle, Pittsburgh and Cincinnati. 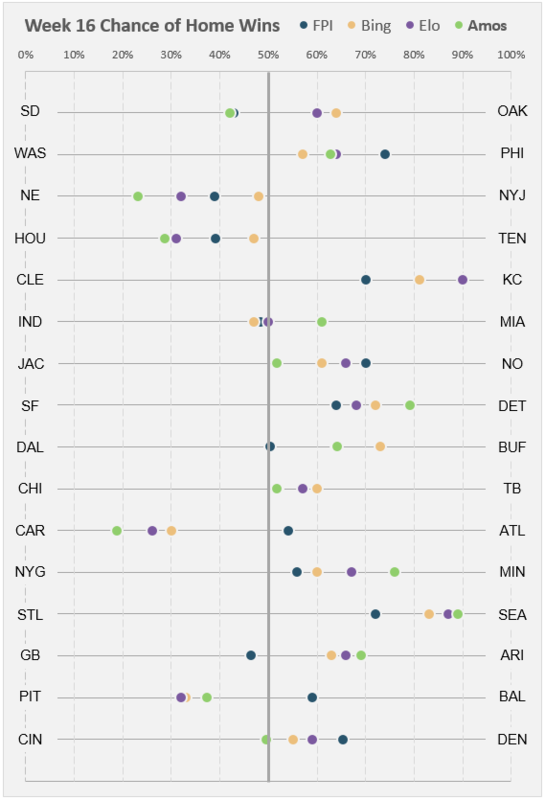 ESPN’s FPI went 10-6, San Diego, Philadelphia, New England, Tampa Bay, Seattle and Green Bay. Microsoft’s Bing went 10-6, Philadelphia, New England, Tampa Bay, Carolina, Seattle and Pittsburgh. Nate Silver’s Elo went 10-6, Philadelphia, New England, Tampa Bay, Carolina, Seattle and Pittsburgh. Moving on into Week 17 picks… Amos and Bing look to break the tie by just two games. 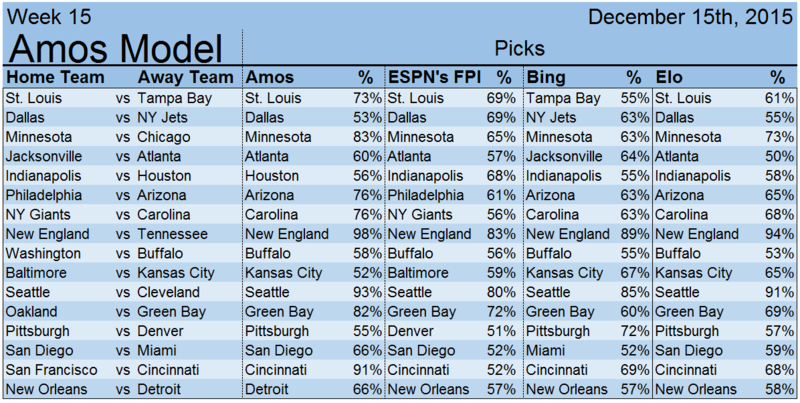 While Amos currently doesn’t have any surprising predictions this week, it differentiates from Bing by favoring Buffalo over the NY Jets (64%) and Atlanta over New Orleans (81%). ESPN’s FPI is currently favoring Philadelphia over the NY Giants (52%), Seattle over Arizona (55%) and San Francisco over St. Louis (53%). Microsoft’s Bing is currently favoring the NY Jets over Buffalo (55%) and New Orleans over Atlanta (53%). 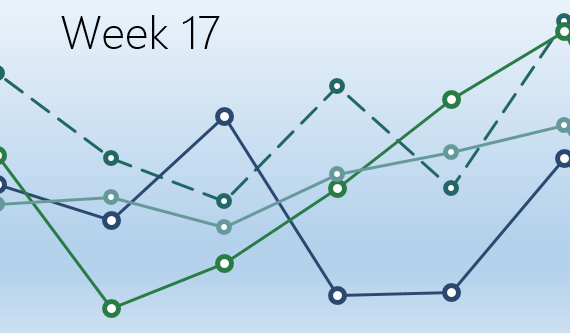 Nate Silver’s Elo has one notable predictions for the week, which is Chicago over Detroit (51%). Finally, from the performances of each of the teams, Amos has simulated the rest of the season. 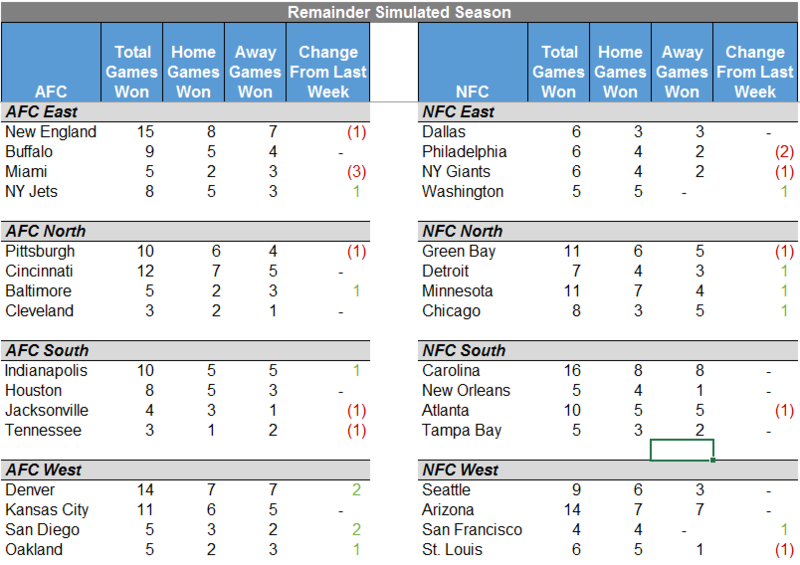 The below simulation is based on the above Week 17 predictions, and will make the final deviations from it if Amos’ predictions are not true. An explosive week for Amos. Amos grabs spot number 2, trailing Elo by 5 games on the season. Amos went 14-2, only having misses of Dallas and Buffalo. ESPN’s FPI went 8-8, having misses of Dallas, Indianapolis, Philadelphia, NY Giants, Buffalo, Baltimore, Denver and New Orleans. Microsoft’s Bing went 10-6, having misses of Tampa Bay, Jacksonville, Indianapolis, Buffalo, Miami and New Orleans. 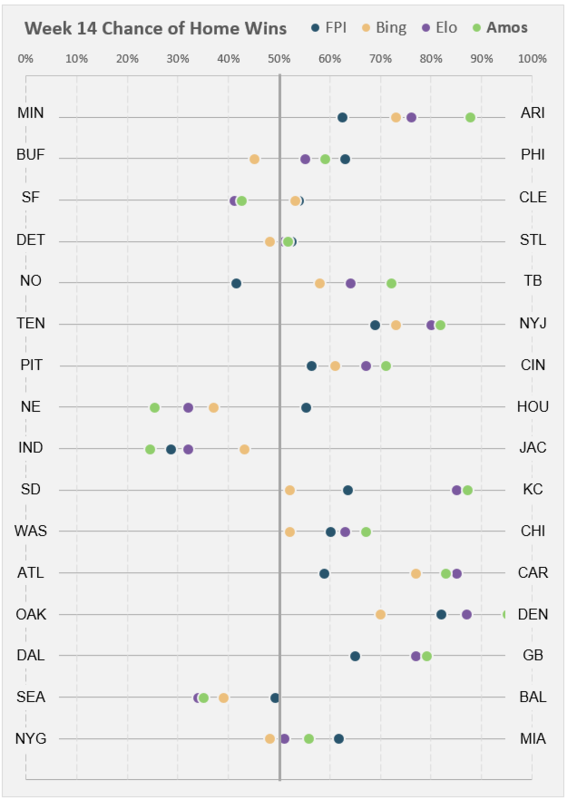 Nate Silver’s Elo went 12-4, having misses of Dallas, Indianapolis, Buffalo and New Orleans. 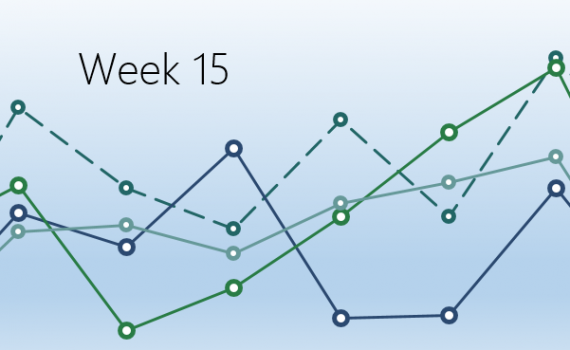 Moving on into Week 16 picks, Bing stays conservative and Amos looks to catch up with Elo. Amos differentiates itself from the other models with picks of Miami over Indianapolis (61%) and Cincinnati over Denver (51%). Additionally the models are split between Oakland vs San Diego, and Amos is favoring San Diego (58%). ESPN’s FPI is currently favoring Atlanta over Carolina (54%), Green Bay over Arizona (54%) and Baltimore over Pittsburgh (59%). Microsoft’s Bing has played it safe this week, only joining the split in the models favoring Oakland over San Diego (64%). Nate Silver’s Elo has the same predictions as Bing, along with favoring Oakland over San Diego (60%). Finally, from the performances of each of the teams, Amos has simulated the rest of the season. Amos has only made a few adjustments for the final Week 17. 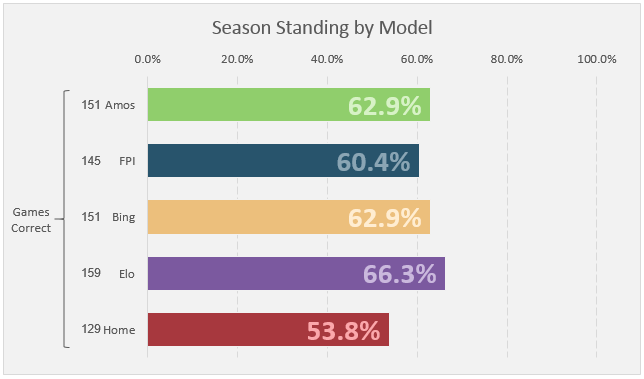 FPI comes out on top for the week, the other models tie for second. Amos went 9-7, having misses of San Francisco, Tampa Bay, Cincinnati, Indianapolis, Chicago, Denver and Miami. ESPN’s FPI went 10-6, having misses of Cincinnati, Houston, Indianapolis, Chicago, Denver and Miami. Microsoft’s Bing went 9-7, having misses of Buffalo, Detroit, Tampa Bay, Cincinnati, Indianapolis, Chicago and Denver. Nate Silver’s Elo went 9-7, having misses of San Francisco, Tampa Bay, Cincinnati, Indianapolis, Chicago, Denver and Miami. Moving on into Week 15 picks, it looks like a variety of games provide a chance for models to change standings on the season. Amos has a handful of deviations, currently favoring Houston over Indianapolis (56%) and Detroit over New Orleans (66%). ESPN’s FPI is looking to extend its lead with more deviations, currently favoring Philadelphia over Arizona (61%), NY Giants over Carolina (56%) and Baltimore over Kansas City (59%). Microsoft’s Bing also has a handful of deviations, currently favoring Tampa Bay over St. Louis (55%), NY Jets over Dallas (63%), Jacksonville over Atlanta (64%) and Miami over San Diego (52%). Elo looks to remain mellow this week. Finally, from the performances of each of the teams, Amos has simulated the rest of the season. The biggest gainers this week was Oakland, adding two additional wins to their season records after their win at Denver. The biggest loser this week is Chicago, resulting in two additional loses for their season record. Amos comes out on top for Week 13, which Amos also tied for first in Week 11 and took the lead again in Week 10, landing itself just one behind Microsoft Bing and two ahead of ESPN’s FPI. Amos went 11-5, having misses of Atlanta, Minnesota, Baltimore, Chicago, and New England. ESPN’s FPI went 9-7, having misses of NY Giants, St. Louis, Atlanta, New Orleans, Chicago, New England and Indianapolis. Microsoft’s Bing went 10-6, having misses of NY Giants, Minnesota, Jacksonville, Chicago, New England and Washington. Nate Silver’s Elo went 10-6, having misses of NY Giants, Minnesota, Baltimore, Chicago, New England and Washington. Moving on into Week 14 picks, it looks like the San Francisco vs Cleveland game is the game to look for. 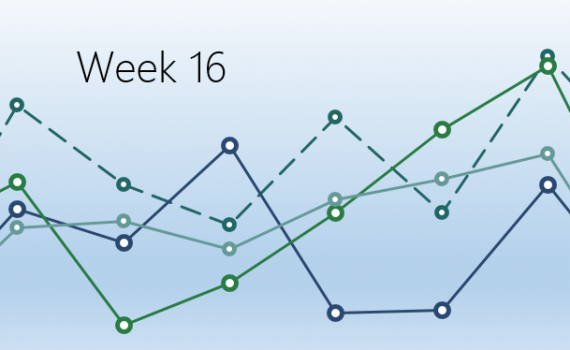 Amos has a mellow week, with its only notable pick being San Francisco over Cleveland (57%). ESPN’s FPI is currently favoring Cleveland over San Francisco (54%), New Orleans over Tampa Bay (59%) and Houston over New England (55%). Microsoft’s Bing is currently favoring Buffalo over Philadelphia (55%), Cleveland over San Francisco (53%), Detroit over St. Louis (52%) and NY Giants over Miami (52%). Nate Silver’s Elo is also having a mellow week, with its only notable pick being favoring San Francisco over Cleveland (59%). 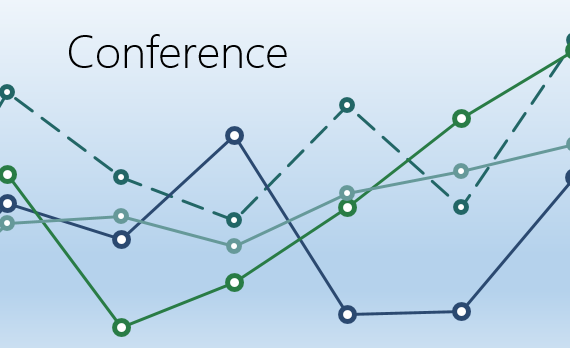 Below compares the confidence of each model. Finally, from the performances of each of the teams, Amos has simulated the rest of the season. The biggest gainers this week were Miami and San Francisco, adding two additional wins to their season records. The biggest loser this week is Indianapolis after their poor performance against Pittsburgh, resulting in two additional loses for their season record. 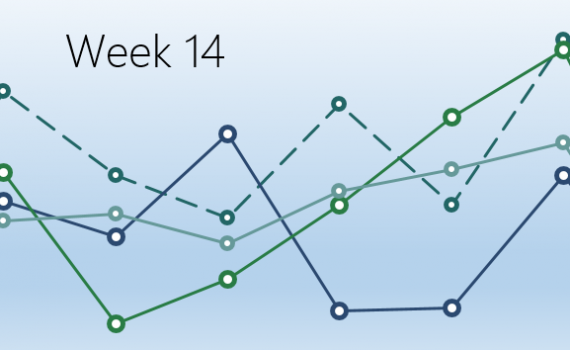 Amos loses further ground to Bing by 1 game and Elo takes the top performance for the week. Amos went 9-7, having misses of Philadelphia, Green Bay, Tennessee, NY Giants, Atlanta, Jacksonville and New England. ESPN’s FPI went 10-6, having misses of Philadelphia, Green Bay, Dallas, NY Giants, Atlanta and Miami. Microsoft’s Bing went 10-6, having misses of Green Bay, NY Giants, Atlanta, Jacksonville, New England and Cleveland. Nate Silver’s Elo went 11-5, having misses of Green Bay, NY Giants, Atlanta, Jacksonville and New England. Moving on into Week 13 picks, a handful of teams working to clinch playoff spots provide some splits between the models. 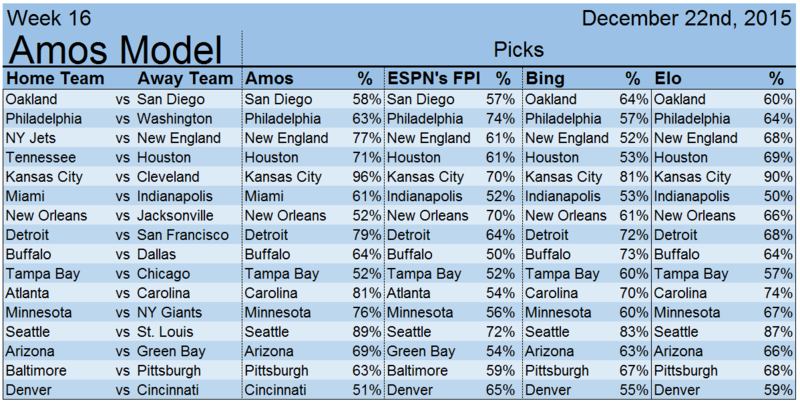 Amos has a variety of notable picks, currently favoring NY Jets over NY Giants (51%), Atlanta over Tampa Bay (61%), Baltimore over Miami (50%) and Dallas over Washington (63%). ESPN’s FPI is currently favoring St. Louis over Arizona (51%), New Orleans over Carolina (56%), Seattle over Minnesota (60%), Miami over Baltimore (55%), Indianapolis over Pittsburgh (53%) and Dallas over Washington (64%). Microsoft’s Bing is currently favoring Tampa Bay over Atlanta (52%), Miami over Baltimore (61%), Jacksonville over Tennessee (53%) and Washington over Dallas (53%). 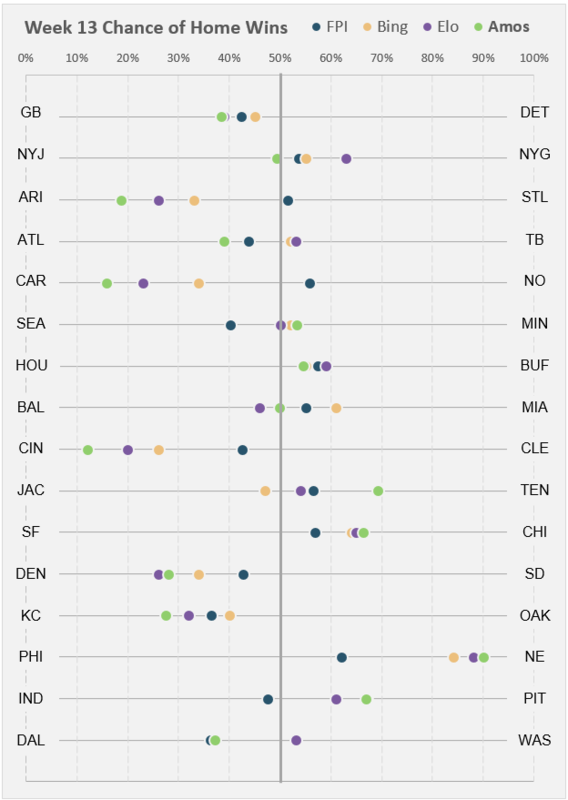 Nate Silver’s Elo is mellow this week, currently favoring Tampa Bay over Atlanta (53%), Baltimore over Miami (54%) and Washington over Dallas (53%). Finally, from the performances of each of the teams, Amos has simulated the rest of the season. 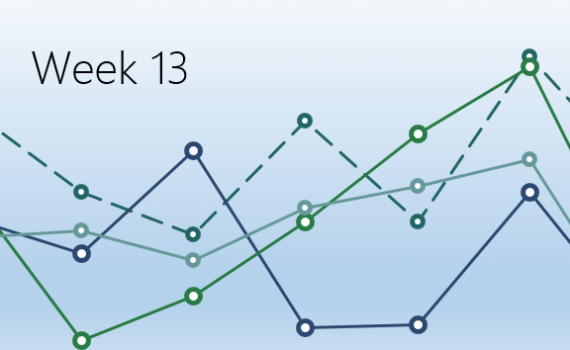 The biggest gainers this week were Denver and San Diego, not only picking up their respective win this week, but also adding an additional game throughout the rest of the season. Denver overcame New England this week, something Amos predicted up until Week 10. However, Amos still has New England winning the remainder of their season games. The biggest loser this week is Miami, who lost two games on their season record.